Triple row of 12 internees; three are crouched in the front and five are mostly obscured in the last row. Clothing suggests the picture was taken in spring or in the fall. An identification card reading "36" is positioned on the ground beside the internee crouched at the far right. The group is positioned in front of a building whose facing seems to be comprised of studded wood planks with two framed windows. First man standing at the far left is believed to be Antonio Di Pietro; behind him to his left is Osvaldo Giacomelli (in the white sweater). This image is clearly taken at the same time as DICEA2011.0001.0010. 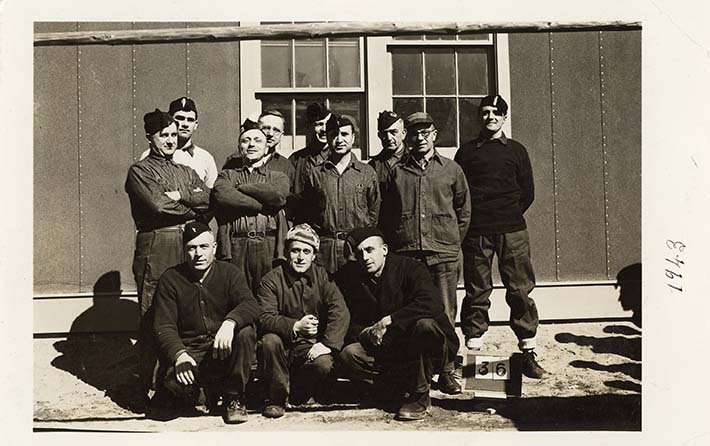 The back of the picture has the signatures of several men, including Italian-Canadian internees, one Italian merchant marine (Testa) and presumably German Canadian internees. In his letter Vincenzo Poggi notes that four of these individuals were part of the fascist component at Camp Ripples: Maravalle, Cocomille, Giacomelli, Di Pietro and Testa (see LDICEA2011.0017.0008). Most of the men pictured are wearing berets, which are adorned with tassles, fascist insignia, and the saying "Me ne frego", which translates to "I don't give a damn". Earlier articles on the subject used such symbols and other activity to imply fascist support by Italian Canadian internees. A recent review by anthropologist Sam Migliore in Beyond Barbed Wires: Essays on the Internment of Italian Canadians, notes the need to consider multiple-meanings when analyzing symbols. As he notes, "symbols of any kind are human constructions that have no meaning in-and-of themselves". While wearing the berets may in fact suggest facist sympathy and support, it may also reflect group belonging and identity, or resentment for the internment experience. Although the picture comprises a group of presumably fascist adherents, wearing fascist paraphenalia, it was not only likley taken by a government official but also reviewed by the Internment Operations department. Barely visible in red ink is presumably the stamp for "CANADA INT-OP CENSORED".